But polls do show high support for banning assault weapons. Rep. Ted Deutch, seated, engages with Sen. Marco Rubio during the CNN town hall on the Parkland school shooting. 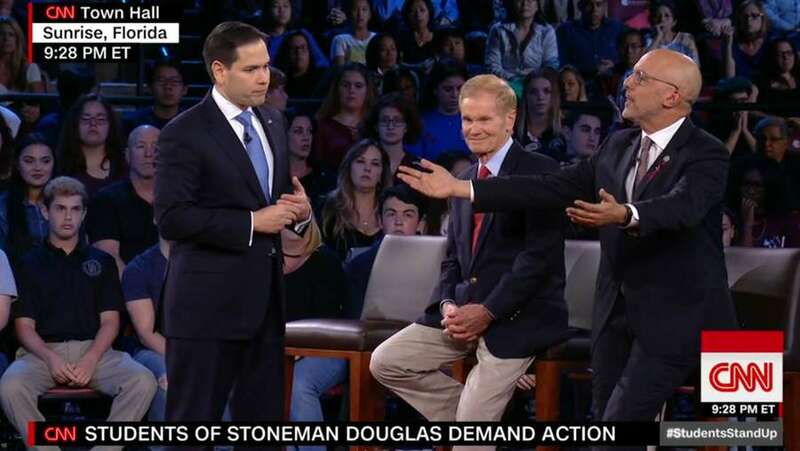 Sen. Marco Rubio earned support for stepping onto the CNN stage last night and he shifted his position on some policy, but afterward he sought to reaffirm his 2nd Amendment bonafides by saying a call to ban all semi-automatic weapons is "a position well outside the mainstream." Keeping in mind Rubio said "all," the idea of banning assault-style weapons such as the AR-15 used in the Parkland massacre is not outside the mainstream. A Qunnipiac University poll released Tuesday showed American voters support a nationwide ban on the sale of assault weapons 67 – 29 percent. A Pew Research Center poll last year had support at 68 percent. A 2016 Morning Consult-New York Times poll showed 63 percent of registered voters supported "banning the sale and ownership of all semi-automatic and automatic firearms." A ban however is staunchly opposed by the NRA and is not popular with the GOP base. And a ban, which is more complicated than it sounds, has little support in Congress. "that dangerous criminals, people that are deranged cannot buy any gun of any kind. That's what I believe a better answer will be." The crowd booed and Rep. Ted Deutch said if that's the case, then legislation should be drafted that eliminates loopholes. He invited Rubio to work on that. "It's not the loopholes," Rubio replied. "It's the problem that once you start looking at how easy it is to get around it, you would literally have to ban every semi-automatic rifle that's sold in the U.S."
This time, the crowd cheered. "Fair enough. Fair enough," Rubio replied. "That is a valid position to hold. But my colleagues do not support banning every semi-automatic rifle sold in America." Rubio at the forum did come out in favor of raising the purchase age of rifles and said he'd reconsider his opposition to a ban on higher capacity magazines. He also says he supports gun violence restraining orders and said arming teachers is not a good idea. Now, advocates for gun restrictions are asking him to follow through and intend to keep up the pressure. Marsy’s Law for Florida is looking for documents about changes in policies and procedures in judicial circuits and information about victims’ privacy protections. The arguments surrounding the bill have erupted into protests at the Capitol, sit-ins at district offices and even an ACLU-issued travel warning for travelers and non-citizens to stay away from Florida. 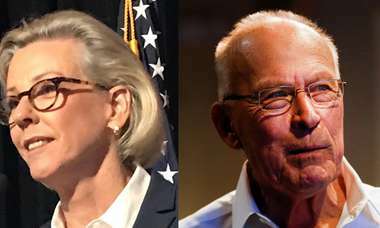 The underdog candidate campaigns at the polls on Election Day in the race for Tampa mayor. DeSantis will have until April 29 to act on a bill that would ban vaping and other electronic cigarettes in workplaces, which the House and Senate passed unanimously. The attorney general wants access to a state database to show that drug makers and distributors recklessly supplied Floridians with opioids. Florida lawmakers say they want to cure election woes. Here’s what they’re doing about it. One bill aims to streamline the absentee balloting schedule and require more training for verifying ballot signatures.